The global household cleaners market is characterized by a largely consolidated vendor landscape with top three players holding more than 49% of the overall market in 2015, says a new report by Transparency Market Research (TMR). The top three vendors, namely Procter & Gamble Co., S.C. Johnson & Son Inc., and Reckitt Benckiser Group plc are engaged in expanding their global presence and are continuously introducing innovative products in a bid to strengthen their positions in this market. “Key companies are involved in expanding their geographical presence for business growth. A case in point is Henkel Company AG & KGaA. In May 2015, the company acquired Colgate-Palmolive’s complete range of pre-wash products and laundry detergents in New Zealand and Australia. Transparency Market Research says that the global market for household cleaners stood at a valuation of US$27,468.6 mn in 2015 and is expected to be worth US$39,400.9 mn by 2024 rising at a CAGR of 4.1% between 2016 and 2024. In terms of product type, surface cleaners, bleaches, and specialty cleaners are the segments of this market. Among these, specialty cleaners held the leading share of more than 60% in the market in 2015. Specialty cleaners are gaining prominence with improved sanitation practices in Asia Pacific. Surface cleaners held a share of 33.5% in the market in 2015 and is anticipated to continue its influence on the development of this market. The segment of surface cleaners is expected to display a CAGR of 5.0% between 2016 and 2024 displaying the most promising growth rate among other product segmnets. Bleaches hold a moderate share in the household cleaners market due to the harmful constitution of most bleaches that may cause skin allergy and skin corrosion among other effects. The segment of bleaches is expected to rise at a CAGR of 2.3% during the forecast period and the segment is expected to display a declined share from 7.3% in 2015 to 6.2% in 2024. North America is the leading regional market for household cleaners accounting for a share of more than 31% in the global market in 2015. The region is followed by Europe with a share of 28.5% in the global market in the same year. 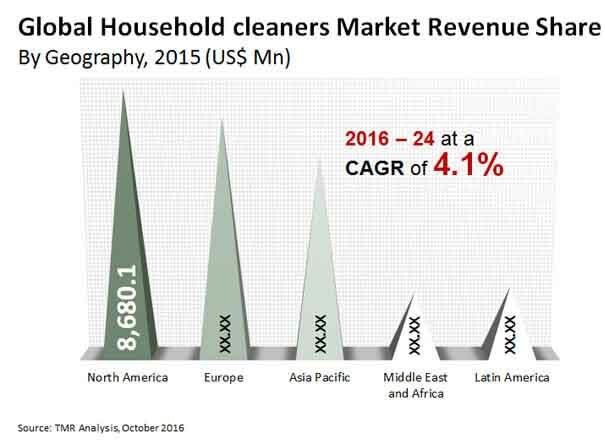 Both North America and Europe are mature markets for household cleaners thus present limited growth opportunities to this market. Moreover, these regions are expected to witness a significant decline in their share in the global market over the forecast period, says the study. Asia Pacific is expected to emerge as the most attractive market for household cleaners in the coming years. Changing lifestyle and increased awareness about health implications of contaminated surfaces are stirring the demand for household cleaners in this region. Rapid urbanization combined with changing living standards in emerging economies such as China and India are also having a positive influence on the growth of this regional market. Increasing awareness among individuals about the importance of germ-free living spaces for health considerations is the chief driver of the global household cleaners market. The impact of this driver has been highly influential in Asia Pacific and Latin America, which are home to some of the most promising emerging economies.